The Monteleone town, used to be a remote defensive bastion of the Orvieto territories to the North, immediately adjacent to Città della Pieve. Its origins of this village date back to the Medieval Period. 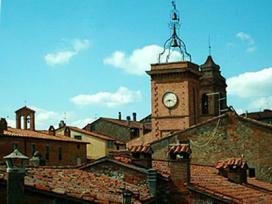 Located in the area of the mid-high Umbrian hills, it is denoted by a lengthened shape of the historical centre. The architectural highlights include, among others works: the Churches of Santissimo Crocefisso Church and of the Collegiata, within which one may admire several painting works of arts, and the Mozza Tower, which represents the access point to the village.